114 calories per serve. Serves 12. Oil spray - calories not counted as used to stick paper only. 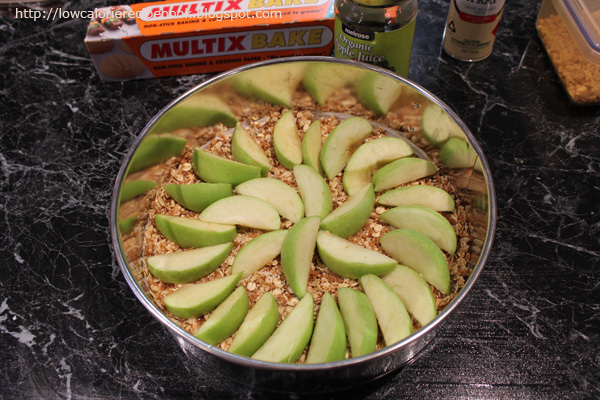 Placing the apples over the base will leave you with approximately 1 cup left over apple to chop and microwave. Preheat oven to 180 degrees on fan forced setting. Sparingly spray a flan or spring-form tin with oil and place over base baking paper. Chop walnuts and place in bowl with crushed biscuits, oats and shredded coconut. Add melted butter, fruit juice concentrate and enough hot water to make mixture wet enough to press into a base. Press evenly over baking paper and bake in oven 160o for 7 minutes. Slice apples removing core but keeping skin on. Arrange over top of base in a spiral. Using remaining pieces, chop and microwave in a bowl until cooked. Add 2 tablespoons maple syrup, 2 tablespoons chopped walnuts and mango flesh. Using a fork roughly squash and combine . 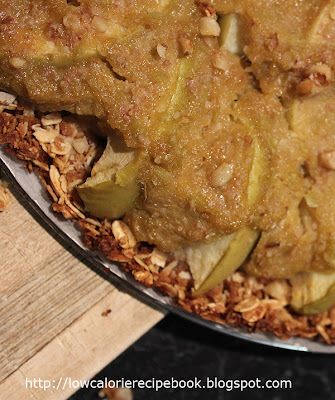 Place mixture in gapes between sliced apple evenly over the top of the flan. 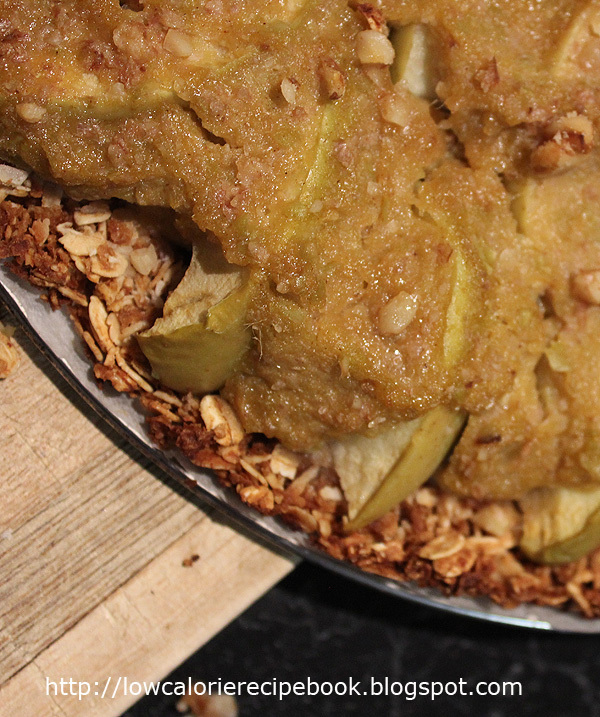 With the remaining syrup drizzle over flan top and sprinkle with remaining nuts. Bake in moderate oven for 15-20 minutes or until lightly browned . You can make a thicker base flan with a medium size flan or spring-form tin and serve it to 10 people. The portion would then be generous but still only 136 calories per serve.